A factory that disposed of Cosmo Chemical’s waste for 30 years has been transformed into a culture space. Photographer Kyungsub Shin’s ‘COSMOS’ exhibition, which is held from Oct. 19 to Jan. 31 2019, signals the beginning of this new trend. Kyungsub Shin has actively interacted with many Korean architects and worked on photography projects. He was invited to the Gwangju Design Biennale ‘Dogadobisangdo’ in 2011, Venice Biennale Korea Pavilion’s ‘Crow's Eye View: The Korean Peninsula’ in 2014, and Venice Biennale Korea Pavilion’s ‘The FAR Game’, exploring the issues of the contemporary metropolis alongside architecture. The ‘COSMOS’ exhibition showcases roughly 110 photos from the ‘Scrutable’ and ‘Pragmatic’ series that observe and question the relation between architecture and capitalist society through photography, and the ‘Cosmo 40’ series that captures the changes of the Cosmo factory. Kyungsub Shin’s key ‘Scrutable’ series views the cityscape of our time and the ways it is being filled with the endless numbers of buildings to question the cosmos, or order that dictates our society, much like how the landscape painting of the Joseon era illustrates the scenery of that time. Pai Hyungmin (professor, University of Seoul) focuses on the internalisation of architecture within the regularised system of cities in Korea as presented in Kyungsub Shin’s work, and noted that ‘the buildings and cities portrayed in Shin’s photographs do not speak through their individual faces but through the organisation of their collection. This is not because Shin is unconcerned by architecture. It is rather a commentary on the modern city and a manner of approaching architecture’. The ‘Progmatic’ series focuses on buildings that show social diversity rather than aesthetic emphases. The photographs portray the photographer’s interpretation of buildings as a means of reflecting the era with the purpose of overcoming the issues of the time, and that is created in the context of society. ‘Cosmo 40’ is the starting point of this exhibition. Cosmo 40 is the only building left in the Cosmo Chemical factory complex located in Gajwa-dong, Seo-gu, Incheon, which once had 45 factory buildings. On the verge of demolition like other buildings, it survived as Kyungsub Shin started working to archive the building upon request, which contributed to calls to preserve and re-use it. Consequently, Cosmo 40 was born. ‘Cosmos’ was produced to present a spectacle, with scaffolding installed to display large photos and fluorescent lights guiding the movement of visitors. 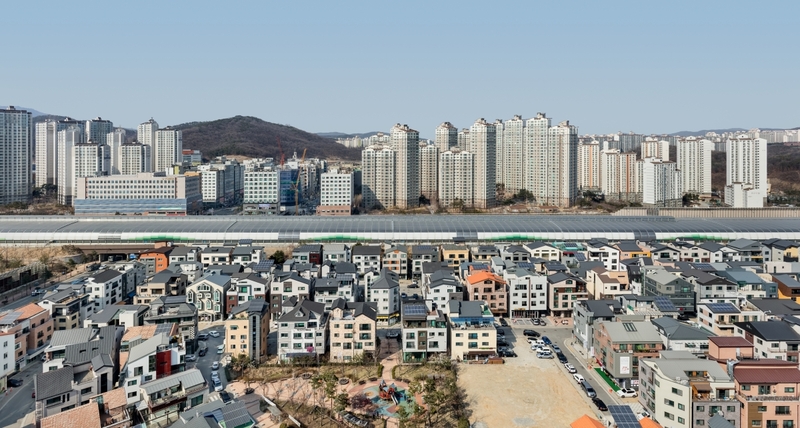 The overpowering scale of the exhibition space, the roughness of the factory building, and the photos that at times take deep stabs at cities in a black comedy manner will offer visitors an experience of viewing the cities we live in in a new light.